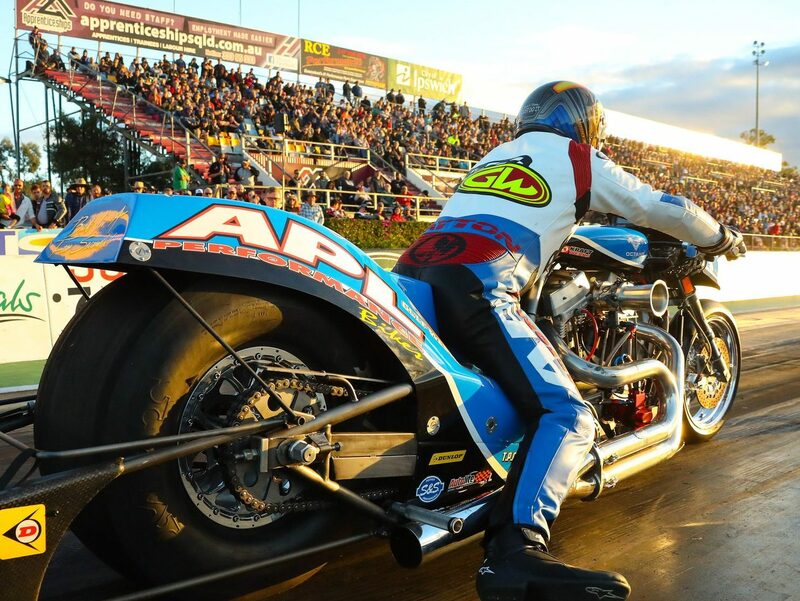 Australian Nitro Harley racer Adam Layton will be continuing his quest to break the world record and inch closer to the five-second zone this weekend at Sydney Drag Way and the first event in the 400 Thunder Professional Drag Racing Series for 2019. He will be on his self designed and built 1500hp nitro-burning Top Fuel V-Twin with the single goal of becoming the fastest person ever on a Twin Cylinder Harley. The 44-year-old has been riding motocross and supercross most of his life. It wasn’t until he reached 40 that he decided to finally get into the world of drag racing. Layton grew up in the Hawkesbury. He has lived here for most of his life and owns APL Performance Bikes in South Windsor. He traveled the world for motocross and supercross but remains located in the Hawkesbury where he raises his young family of three. The Australian record for someone on a V-Twin is 6.3 seconds with the world record at 6.1 seconds. Layton is confident that his bike can beat those times and he wants to reach 5.9 seconds or faster. “I’ve always been that guy that has to be in front, no matter what it is I always had to be the fastest,” he said. Drag racing has a high level of danger to it. The speeds that you travel at, the G-force you feel and the use of nitro in the engines makes drag racing an extreme sport. For Top Bike they are without a roll cage for protection surrounding the rider, outside of a ballistics vest and racing gear which makes what Layton doing one of the most dangerous sports in the world. “It is the hardest motorsport in the world and it’s the hardest thing I’ve ever done but it’s something I’m happy to be doing,” he said. Layton’s bike is completely designed and built by himself and his crew of workers from his South Windsor based motorcycle shop. It has a unique fuel system designed by Layton which is the first on a motorcycle and what he believes will be the cause for him breaking the world record. “And in the two to three weeks leading up to a meet we work on the bike even more with two mechanics full time including myself. Layton believes that Top Bike is the most exciting thing he has ever done. He said the atmosphere of a race constantly changed as each individual step was completed in the lead up to the start line. The race takes absolute focus from not only himself but his well trained crew. They have to ensure that everything is perfect, which includes ensuring that the bike is set to race in the conditions that they are experiencing. The world of drag racing is huge and international. Despite being a part of a handful of riders who are at the elite level Layton is among a massive international community in Top Fuel. The race itself is only six to seven seconds long and no matter the preparation, success comes down to Layton’s ability on the bike. “When you come out of the tunnel at the dragway there are 60,000 fans cheering, plus everyone watching it live across the world. “When you race you travel so quickly… the jump almost doesn’t feel natural…I’m often like, “wow, how did I get here?” and I look back to the start line that is half a mile away by the time I’m stopped. Layton, despite the excitement and speed, ironically finds racing to be relaxing as he said, “everything else in the world fades away during meets”. “All that matters is the bike and getting to the other end of the track. “Myself, the whole team and everyone involved just forget about politics and all of the other stuff around the sport and just race. Layton races in the 400 Thunder Professional Drag Racing Series around eight times a year across all of Australia. He will have his first meet of 2019 on January 18 and 19 at Sydney Dragway on Ferrers Rd, Eastern Creek, which Layton says is the best place for him to reach the 5.9 second mark in Australia.